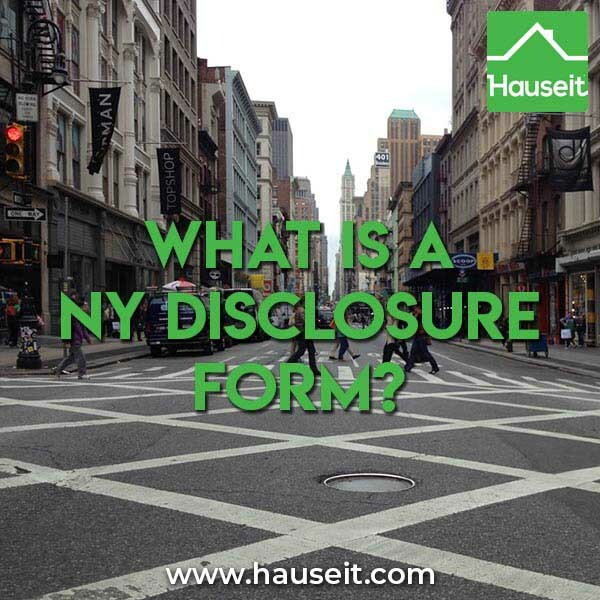 A NY Disclosure Form, more formally called the New York State Disclosure Form for Buyer and Seller, is an agency disclosure form that real estate agents are required to hand out to home buyers and sellers. The form explains various types of real estate agency fiduciary relationships and clearly marks in whose interest the real estate agent serves. It’s important to know that you can refuse to sign the NY Disclosure Form even though real estate agents are required to present it to you. Moreover, even if you were to sign it, it is not a contract or binding agreement of any sort, but simply a NY State mandated disclosure form. When will sellers be presented with the NY Disclosure Form? Sellers will usually be asked to sign the NY Disclosure Form at the same time they sign their Exclusive Right to Sell Listing Agreement. For example, Hauseit sellers are able to conveniently e-sign both the NY Disclosure Form and their Flat Fee or Full Service for 1% listing agreement within the same document. The most common agency relationships between listing agents and sellers are: Seller’s Agent, Dual Agent or Dual Agent with designated sales agent. Meanwhile, the two most common agency relationships between a buyer and an agent are Buyer’s Agent or Dual Agent. This is the most conservative choice of agency relationship between a brokerage and a seller. However, it is impractical for most brokerages to implement as the brokerage will have many agents who currently represent potential buyers for the seller’s property. Therefore, it would be impracticable for the brokerage to solely represent the seller unless the seller wishes to exclude all of the potential buyers represented by the brokerage. This choice is unsavory for both buyers and sellers as the agent will theoretically be representing the interests of both competing parties at the same time. In practice this becomes impossible and an ethical agent will have to restrain from sharing any extraneous information from both parties. For example, if the Dual Agent knows that the seller is desperate, he or she cannot share this with the buyer. Or if he knows the buyer can pay more, he cannot share this with the seller. This makes the agent much less useful to either party and the buyer and seller may as negotiate directly! Be careful though as unethical agents may flaunt their fiduciary duties to either or both parties in order to get a deal done. Unfortunately, it is more likely that the Dual Agent will favor the interests of the seller since the seller client will still be there in case the buyer backs out, and also because the seller pays the commission. As a result, buyers should never be bullied into accepting Dual Agency when purchasing a home. Why would you give up your right to free and undivided representation from a veteran buyer’s agent? Why would you give both sides of the commission to a listing agent who may or may not have your best interests in mind? Furthermore, why would you pass on an opportunity to earn some of that commission for yourself through a buyer commission rebate? A common compromise for sellers who don’t want to accept Dual Agency from day 1 is to check the box for Seller’s Agent but also check the box for Advanced Informed Consent Dual Agency. This way, the listing agent will solely represent the seller’s interests until such time that Dual Agency may arise. If a buyer agrees to Dual Agency, then the seller has already agreed in advance to it and there is no need to clear Dual Agency with the seller. This will be advantageous to the seller in a Full Service for 1% listing as the seller will have the opportunity to save more in commission if the listing agent can convince the buyer to remain unrepresented. In this scenario, the brokerage is a Dual Agent but there are separate agents of the brokerage representing the buyer and seller. This situation is more common and acceptable if a separate agent of the same brokerage legitimately happened to be working with a buyer who became interested in a property listed by another agent of the same brokerage. This this case, you’d hope and assume that the two agents are not colluding and sharing information with each other against the interests of their clients. Furthermore, you’d hope that the brokerage which knows information about both sides of the deal stays neutral. This situation is common with larger brokerages with many agents, and typically agents will have enough sense to remain loyal to their respective clients. This is the most common sense relationship for a home buyer to have with an agent. Not only will there be no confusion as to whose side the agent is on, you can also earn a portion of your buyer agent’s commission through Hauseit. Whether you have a buyer rebate agreement in place or simply have the rebate amount in writing, your incentives become even more aligned with that of your agent’s. This is because you will personally be affected by how much the commission amount varies! Please remember that you can flat out refuse when listing agents try to get you to sign that NY Disclosure Form with Dual Agent checked. They are required to present the form to you but you are not required to sign it! What if I’ve already signed a NY Disclosure Form? It doesn’t matter! If you’ve been bullied into signing a NY Disclosure Form by a listing agent with Dual Agent checked, you can always choose to be represented by a Buyer’s Agent later. The cost of your representation is built into the sales price. You and the seller are paying for the cost of broker representation for both parties. It is unreasonable for you to be bullied into throwing away the benefit of your representation! In fact, a listing agent would be stealing from you if you agreed to dual agency. Why? Because some of that commission could have been instead earned by you via a buyer broker commission rebate! Take 2 minutes to Sign Up today!